When I’m having an especially busy day, pasta is the one dinner I always reach for. It’s easy, quick and cheap, and it’s something I can throw together in a moment’s notice. 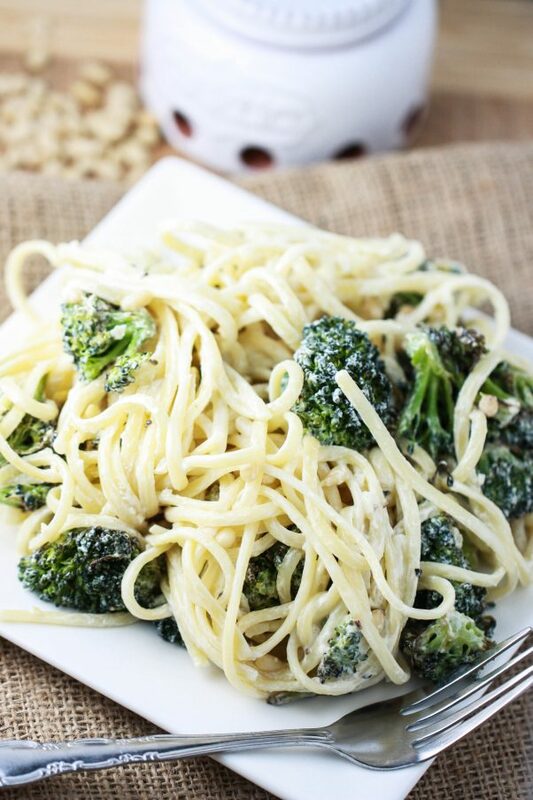 This absolutely delicious recipe features roasted broccoli, linguine and pine nuts tossed in a light and creamy goat cheese sauce. I love goat cheese on anything, and this dish is no exception. If you’ve never tried roasting your broccoli before, you’re in for a treat! Confession time: I really don’t like broccoli prepared any other way. When it’s roasted, broccoli takes on almost a nutty taste — much unlike the mushy boiled broccoli of my youth that completely lacks any flavor. This will convert any self-proclaimed broccoli hater for sure! This pasta dish is best enjoyed right after it’s made. Adding a splash of pasta cooking water to the sauce helps the pasta to not dry out. 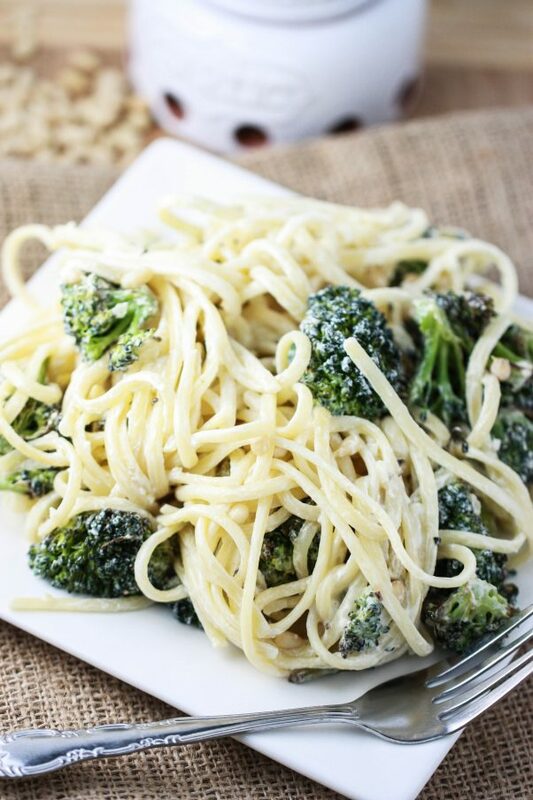 You will love the way the roasted broccoli plays with a creamy goat cheese sauce. 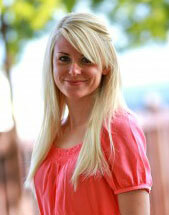 Food blogger Jenna Weber shares shares why she loves to roast her broccoli in a full post on the Fresh Tastes blog. Preheat oven to 400 degrees. 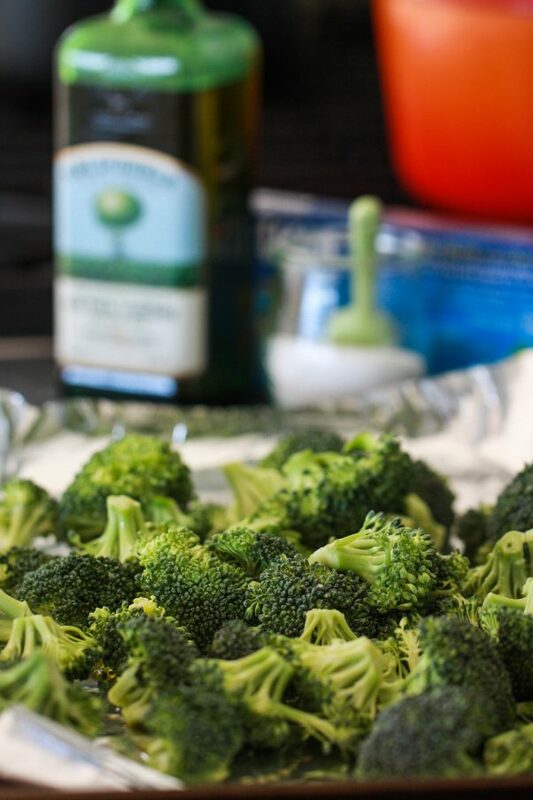 Line a baking sheet with tin foil and place the broccoli florets on top. Drizzle with a half tablespoon of olive oil and toss to coat. Roast broccoli for about 25 minutes, tossing occasionally. Bring a large pot of water to a boil. Add a big pinch of salt and the linguine. Cook until pasta is al dente. Drain, reserving 1 cup of pasta cooking water. In a large skillet, heat up the remaining tablespoon of olive oil over medium heat. Add the minced garlic and sauté for about 30 seconds until fragrant and toasty. Add the goat cheese and stir to melt, drizzling in some pasta water to create a smooth sauce. Add the hot linguine and roasted broccoli. Toss well, adding more pasta water if dish seems dry. Season with salt and pepper and scatter pine nuts on top.